I know many of your children have already started back to school, but our family’s “official” start date is tomorrow. 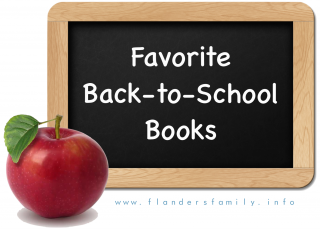 Here are a few back-to-school themed books that we enjoy reading — not only in August, but all year long. If you’ve missed any of these titles, look for them next time you’re at your local public library, or click through the links provided for information on ordering them through Amazon. We hope you and your child(ren) will have an awesome school year, and that you’ll learn many new and amazing things during the course of it! 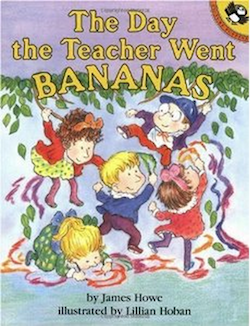 The children in this book seem unfazed when a gorilla shows up one morning to teach their class. They go along happily with his unconventional lessons in finger painting, toe counting, and tree climbing. All too soon, the principal rushes in to explain there’s been a terrible mistake: the real teacher had been sent to the zoo by mistake, which is where their hairy substitute actually belongs. My little ones bust out laughing every time I read this one. The morning Wilma woke up green, her mom thought she needed to stay home from school, but Wilma hopped out a window and onto the bus before anyone could stop her. 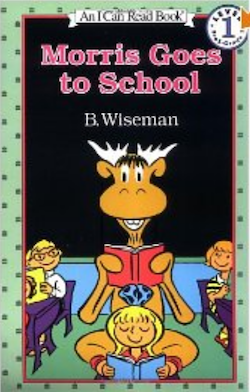 There’s a fly in her classroom, though, which makes it hard for Wilma to focus on her lessons. My kids love Tedd Arnold’s witty text and hilarious illustrations. 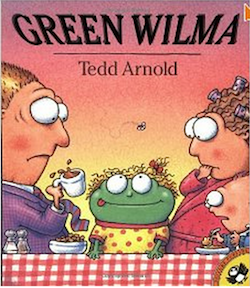 We own several of his other books, but Green Wilma’s still our favorite. 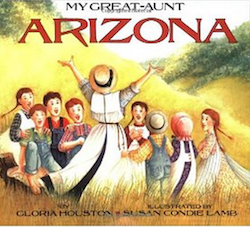 Arizona is a little girl with lots of heart and big dreams. Both grow as she does, and when she later becomes a school teacher, she pours all those dreams and aspirations into the hearts of her students. The story is sweet, and reminds me just a little of It’s a Wonderful Life. 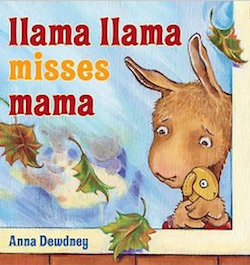 Llama has a little separation anxiety about starting preschool, but it dissipates over the course of the day. He didn’t want to stay when Mama dropped him off in the morning, but by the time she returns to pick him up, he’s had a change of heart. My little boys love dinosaurs, so Yolen’s and Teague’s books are favorites at our house. 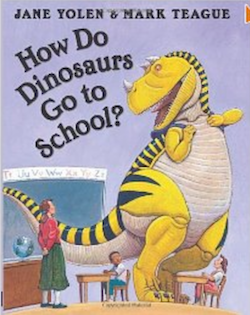 How Do Dinosaurs Go to School provides a good review of classroom etiquette using whimsical rhymes and detailed illustrations. Even though my kids don’t spend their days sitting in traditional school desks, they love imagining what life might look like with a stegosaurus as a study partner. Our family has been following Morris to school for many, many years now. My children laugh about the funny things the studious moose says and does, but as a homeschool mother, I love Morris’s unbridled enthusiasm for learning. Even if a few subjects do give him a little trouble. 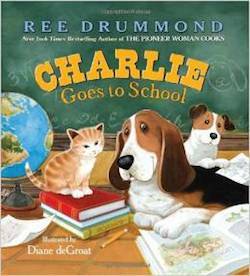 Here’s one that will be of special interest to homeschoolers: The Pioneer Woman details the kind of lifestyle learning that takes place on a ranch, as her lazy, loveable basset hound, Charlie, sees all the children absorbed in their lessons and decides to teach a few classes himself. We have lots of favourite books, Jez Alborough being one of our favourite authors, but I can’t just think of any books about school! Thanks for your favourites list. They have become gift ideas.